"Creep" is a song by the English alternative rock band Radiohead, written by vocalist Thom Yorke. 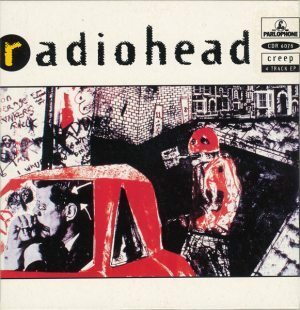 Radiohead released "Creep" as their debut single in 1992, and it later appeared on their first album, Pablo Honey (1993). During its initial release, "Creep" was not a chart success. However, upon re-release in 1993, it became a worldwide hit. The band began to dislike the song, as fans attended their early gigs primarily for the performance of "Creep". During the mid-to-late 1990s, "Creep" was played less frequently at gigs and in 1998, the band dropped the song from setlists altogether. It would not be played live again until 2001, and has since appeared sporadically in the band's live sets. However in 2009, during the Spring tour of South America and Mexico, the song was played at almost every gig, possibly because Radiohead haven't toured those areas for many years. "Creep" is one of Radiohead's biggest hits, and has been used in various media as well as having been covered by a number of musical artists.